I have a class A motorhome bought used. It is in nice shape except for one problem. When I plug the power line into a GFI plug, it trips the connection. The RV has a GFI in the bathroom that seems to be working. Got any ideas? John, the problem could be located either in your RV or in the park wiring. 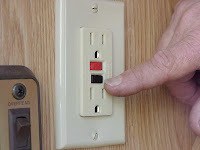 It is important to know if the same GFCI, (ground fault circuit interrupter), on that pedestal trips when another RV is connected to it, or is it just yours? Also, is it possible for you to try another GFCI-equipped pedestal? Perhaps at another site? It is quite possible that single GFCI is weak or faulty, but it's also possible the entire park is miswired. 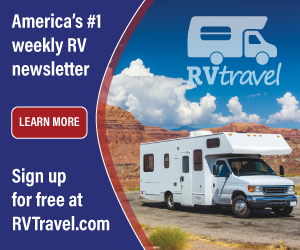 Here's what you can do; With the RV plugged into a source of 120-volts, check each receptacle in the coach with a voltmeter and a polarity tester. You may just find a receptacle with reversed polarity. Also, the GFCI in the RV could be wired incorrectly thereby allowing the "hot" lead to cross over to the neutral bus since both sets of wires connect to the GFCI in the coach. In addition, with all power removed from the rig, remove the GFCI receptacle in the bathroom and identify each set of wires entering the receptacle box. Note the contacts on the GFCI are labeled, "line" and "load." The incoming black and white wires connect to the "line" terminals and the remaining black and white wires, (the rest of that circuit), connect to the "load" terminals. It may be necessary to electrically activate the system to determine which set is which. I recommend a qualified RV service technician take over at this point. With the coach plugged in, one set of conductors at the GFCI will indeed be "hot." The technician will use a voltmeter to determine the hot "line" set of wires and their proper connection to the GFCI. If that does not clear the problem, it will be necessary to perform a hi-pot test, also called an insulation breakdown test. When applied to the electrical shoreline cord, the hi-pot test forces high voltage back through the system and reveals if any leg of the circuit is faulty. Further troubleshooting can determine if a particular circuit is at fault or if one wire in that circuit is shorted. It sounds like a visit to your local RV service center may be in order.